Viking warriors lived in fairly cold climates, and this of course had an effect on the clothing the Vikings would wear. Scandinavia and its temperature are consistent with northern Europe, and the often cold weather meant that Viking warriors wore layered clothing to keep them warm in the often mild summers, and typically harsh winter months. Practicality was the main focus of any Vikings clothing, and of course this was just as true if not more so for the ancient Norse warriors. Due to their need to travel overseas, often on long sailing journeys it was crucial that the Viking warriors wore attire that suited the often cold and harsh elements they would encounter on the oceans seas. The other important and critical clothing neccessity for a Viking warrior was to keep his freedom of movement. In the heat of battle the incorrect clothing would add considerable strain to any warrior. The Viking’s clothing however was loose fitting enough to allow ease of movement but was not fancy or intricate enough to cause problems in the melee of a scuffle. The staple items of every Viking warriors clothing were typical in ancient Norse times. Shoes, trousers, shirts or tunics and cloaks would make up the foundation of a Viking warriors wardrobe. All clothing whether shirts, tunics or trousers would be designed to keep the wearer warm, to be simple and loose fitted for carrying out everyday tasks. Cloaks were an important item for the Viking warrior, not only would they keep them warm in the daytime, they could be used as covers at night. With the raiding nature of ancient Norse life, a Viking could spend weeks sailing and invading new lands, and of course there would be no homes on the ocean to sleep safely in. 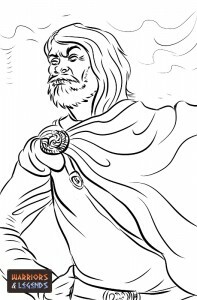 In this situation the Viking’s cloak would offer him protection against the elements. A proud Viking wearing the traditional clothing of the Vikings a cloak. The cloak itself would be made of closely woven wool, and would be fastened around the neck using a simple metal brooch. In case of a battle the cloak could easily be discarded before charging, on the possibility it could entangle or ensnare the warrior himself. In the harsh Scandinavian weather, full length trousers were common for all Viking warriors, simply tied at the waist with a drawstring, the trousers would keep the Vikings legs warm for their long marches into new lands. The trousers would be paired with a long sleeved tunic, which would be worn over the top of an under shirt that would commonly be made of linen. A Viking tunic and belt, used to hang many of their daily items, like axes, pouches and more. An important accessory for any Viking warrior would be a leather belt, worn around the waist and over his tunic. The belt would have a metal buckle and allow the Viking to carry his weapons, commonly a sword and even a knife or axe. Often a warrior would also wear a leather strap over one shoulder, which could also be used to hang a sword in a more comfortable position than off a belt. Norse warriors would also wear hats when travelling, woollen hats were common and of course much easier to wear than a metal helmet when not in battle. 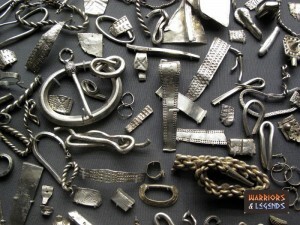 A fine selection of Viking jewelery, all typically silver the favorite metal of the vikings. Function was the primary goal of the Viking warrior when looking for suitable clothing, with form not even being considered. 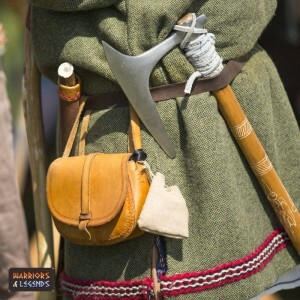 The clothing had to keep the warriors warm while in transit to their next raid or overseas excursion, and it was equally important that it would not hinder the success of the Viking warrior while in battle.